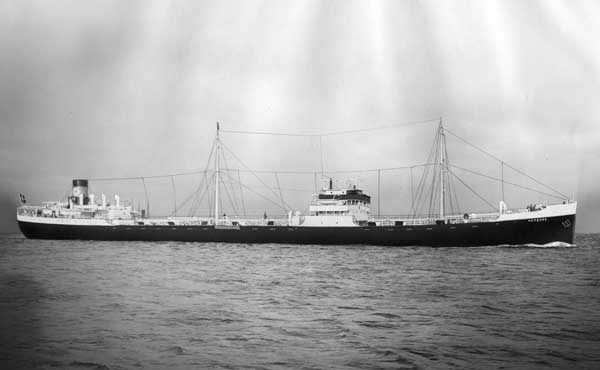 Completed 1931 as Herborg for Skibs AS Joland Norway. 1942 to Tankdamfer Ossag and renamed Hohenfriedberg. 16-2-1943 sunk by HMS Sussex. In December 1942, a group of nine club members together with five other Manila-Germans departed aboard the Hohenfriedberg, a captured Norwegian tanker of t 892 gross tons, originally named M/T Herborg. The vessel was under the command of Capt. Heidelberg and had left Yokohama on November 11, with secret orders to run blockade and reach one of the German naval bases in France, probably Bordeaux. She called at Manila to load coconut oil before continuing her long and dangerous voyage. The circumstances under which the 14 a??volunteersa?? were selected or recruited in Manila are not quite clear. After sailing around Cape of Good Hope, the Hohenfriedberg reached the latitude of the Azores on February 21, 1943, and from then on was escorted by four German submarines. In spite of the security measures, the Hohenfriedberg was not to escape the Allied forces. Before the tanker was able to reach the Bay of Biscay, it was spotted by an American aircraft and subsequently sunk by British cruiser HMS Sussex on February 25, 1943. After an unsuccessful torpedo attack on the Sussex, U-boat 264 spent numerous hours recovering the survivors of the sunken tanker. All of the Manila volunteers were rescued and taken to St. Nazaire, France. My father was among these Germans. He broke his leg on bord so the captain had him leave the ship in Singapore. My father told me he had spent some time in the Japanese Hospital former British Military Hospital, Singapore. After his leg was healed he somehow managed to returned to Manila to overcome the ordeal there Feb. 1945. Can you provide me with the passenger list of the ship s last voyage to Germany? I am writing a book about my father and recieved the above information from a German in Manila who is a historian. Have you sailed on Hohenfriedberg? Log in and add yourself as a sailor to the Hohenfriedberg! Log in and add your personal story to the Hohenfriedberg!